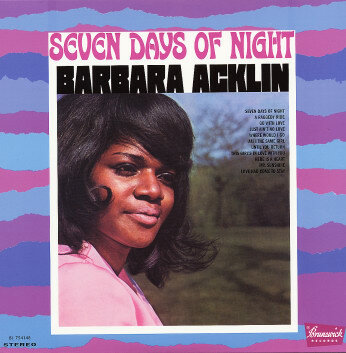 Barbara Acklin – A soulful piece of Chicago…. She did, however, leave behind a recorded legacy which is not only pleasant, but quite interesting as well. Being a colored girl, she was automatically tagged as a “soul” singer when she started out, but although she was soulful, she also seemed to be equally at home singing pop tunes and more middle of the road material, and she had even studied classical music for a time, which might explain how she so easily reached those high notes she sang occasionally. In addition to a great voice, she was also a gifted song writer – and her credits as such is proved by a lot of her songs being recorded by other singers. 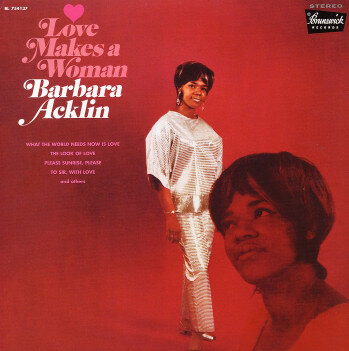 Vocally, Acklin was never a gutsy, deep soul wailer – she emits a soft, pleasant – at times almost breathy – kind of voice, but it more than proves that her subtle way is equally effective as those heavy shouting mamas! If any other singers is to be compared with her, she is vocally closest to Jackie Ross and Barbara Lewis, maybe even Mary Wells at times…. She also had the opportunity to see the music business from the inside – she started working as a secretary-receptionist at Brunswick Records in her early twenties! Somebody in that company obviously discovered her, as within a few years she was labeled “First Lady” of that company – and not because of her typing skills! Before long, Barbara luckily found herself in front of the microphone, rather than behind the receptionists desk – and a couple of her first records (“I’m not mad anymore” and “Nobody cares”) went absolutely nowhere. Then Brunswick thought of pairing her with Gene Chandler – which proved to be a match made in heaven! She made a total of six duets with him, and the first to make any impact was “Show me the way to go”. 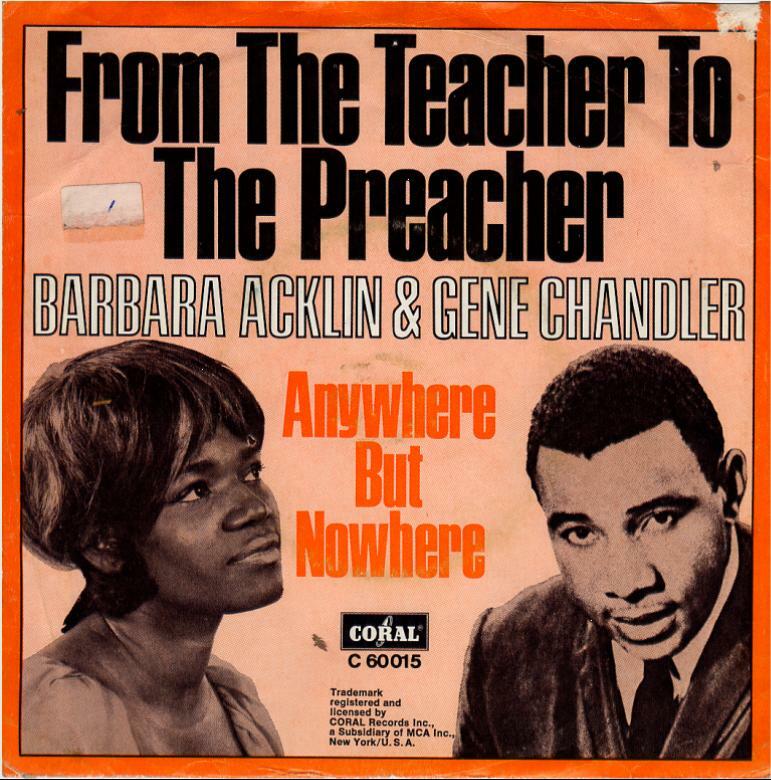 Following Barbara’s first small hit “Fool, fool, fool (Look in the mirror)”, she & Gene were cast into a great duet about puppy love gone adult very fast, “From the teacher to the preacher” – a truly classic slice of late 60’s soul! She also wrote songs for other singers, and both Jackie Wilson and The Chi-Lites recorded some of her songs. With a hit duet to her credit, Barbara started working on her first album for Brunswick. Titled “Love Makes A Woman” and released in 1968, it was a very good album that showed this new talent to her best advantage, and also made her stand apart from all the other soul girls active at the same time. Aided by great songs like “I’ve got you baby”, “Come and see me baby” and two covers of recent hits: “The look of love” and Lulu’s No. 1 hit “To Sir, with love” it was full of gems. The title track soared up the charts, and even today stands out as the most famous of Acklin’s hits – and a real classic. It was re-done some ten years later by Phoebe Snow, another great and much underrated singer – whose version of the song compares favourably to the original. She made her sophomore album the next year; called “Seven Days Of Night” it gave her more charted singles, and standout tracks from this album include “Just ain’t no love”, the fabulous “Where would I go” and of course “Am i the same girl” which was covered effectively in the UK by Dusty Springfield, and also saw an instrumental cover, “Soulful Strut” by Young-Holt Unlimited. She also recorded another cover, the recent hit song “This girl’s in love with you”. Second album, “Seven Days Of Night” came out 1969. The cover shot however, shows just day with no trace of night…. Her first two albums were stylistically in the same vein. For her third album, “Someone Else’s Arms” she turned a little more funky, adding an exciting line of horns and some jarring guitars to back her up, while also doing even more MOR material. On this record she did great versions of the Mondo Cane movie theme “More”, the samba hit “Quiet night of quiet stars” (recorded by everyone from Doris Day to Cleo Laine! ), and she was one of many female singers who covered Blood, Sweat & Tears’ “Spinning wheel”. This last song was also recorded in 3 great, but different versions by caucasian Motown soul girl Chris Clark, Peggy Lee and Shirley Bassey! Barbara was one of the first girl singers to record “More today than yesterday”, a song which has also been done by Dee Dee Warwick, Lena Horne and Patti Austin – all of them very good! 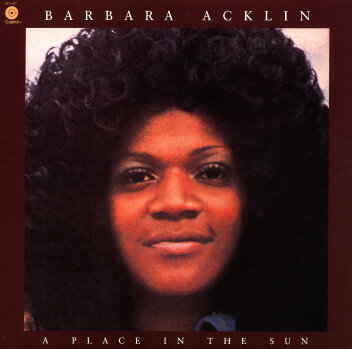 After this, the chemistry between Brunswick and Barbara lost some of its sparks, and her next albums “I Did It” (1971) and “I Call It Trouble” (1972) contained some of the same songs, and didn’t give Barbara any big hits. She recorded one of the many versions of “Stop, look (Listen to your heart)”, but stuff like “I’ll bake me a man” was way beneath her talent, and she was obviously sad about having to record such crap! Her last Brunswick single, “Love, you are mine today” is very good though! Throughout the 70’s and 80’s there were several compilations of her hits from the Brunswick years put on the market. 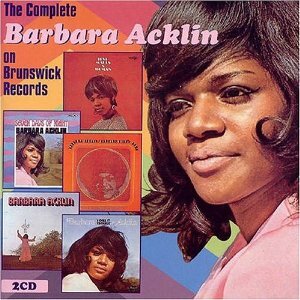 It wasn’t until 2003 that somebody finally came up with the idea of collecting ALL her Brunswick recordings, and so the great 2 CD collection “The Complete Barbara Acklin on Brunswick Records” contains all her 5 albums for that label and some songs that had been released as singles. It’s a great document on a much underrated singer, chronologically guiding you through her career 1968-73. Strongly recommended! Get this! 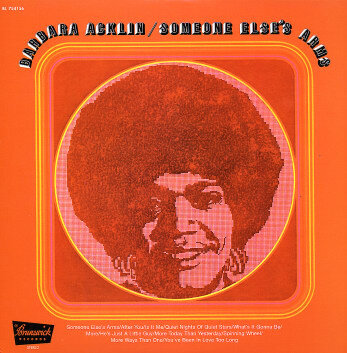 It contains absolutely everything Miss Acklin recorded as a solo artist from 1968 up to 1973, great collection! She switched label, and signed up with Capitol – for what turned out to be her last album – the 1975 “A Place In The Sun”. One track, “Raindrops” was put out as a single, and it did fairly well. It was the last time the Acklin name graced the charts. The album shows a more mature Barbara, spreading her voice on some longer tracks and also being a bit playful on “Fire love”, which surely uses the First Choice’ recent hit song “Armed & Extremely Dangerous” as its model. I always found the cover of this album to be awful! Sporting a big afro, Barbara is pictured up close, wearing no make-up and looking rather pallid. I’m sure the idea was to make it “natural”, but she comes off looking rather tired and worn…. After this, Barbara Acklin faded from public view, but not from the business entirely. She kept on writing songs for others, and made live appearances here and there. She had a local radio hit in 1990 with “You’re The One”. She was one of the headliners at the 1994 “Windy City Soul” tribute at the Chicago Blues Festival, and the audience got to see this rather neglected and half-forgotten lady sounding and looking tremendously well! There was talk about her being in the studio recording a new album in 1998, it would have been the first new Acklin album in 23 years. Sadly, this never happened when Barbara got pneumonia, and died from it in Omaha, Nebraska in November 1998. She was just 55 years old, and it’s a very sad end indeed. If the 1998 sessions produced any result, it is to hope that the studio will release them. Otherwise we will make do with the rest of her musical legacy, which is rich in both great songs, great arrangements – and all of it given vivacity and sparkle by one of the great unsung heroines of soul….